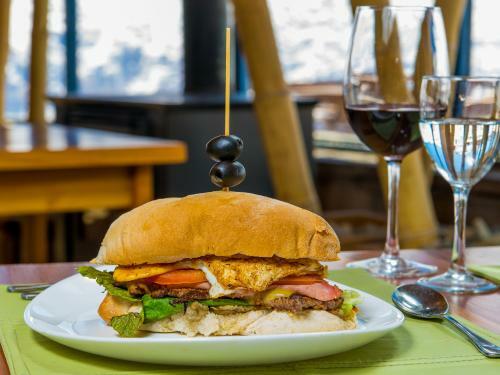 With rustic and family atmosphere, La Rotonda is the first restaurant service available in the ski area of El Colorado Farellones, and offers a unique and varied menu of dishes with a creative kitchen design with high quality fresh local ingredients accompanied by fine wines from our lands. Whether from the spacious terrace, an elegant sun deck, you could enjoy the warmth of the sunset, or from the inside with a wood fireplace, which is the ideal spot for après ski for those seeking a quiet and relaxing end of day in the mountains. We can accommodate 80 guests at the terrace and 60 in the dining area. A stone structure and without breaking the harmony of its surroundings, La Rotonda restaurant complete the hotel complex with an exquisite view of the Andes and surrounded by a stunning 360 ° scenery. The space is ideal for private events and group dinners. For our guests, a full menu is served with continental breakfast in a buffet display and a gourmet dinner complemented with salad bar, main course with two options to select and dessert. Service “a la carte” is varied and has something for every taste and budget. Our staff has a high level of service and are fully committed to guest satisfaction. The restaurant can be reached at +56 2 2321 1020.